The Rhombo Hexoshield® cover system (patent pending) hybrid cover was designed and manufactured by Advanced Water Treatment Technologies, Inc. to combine the advantages of the Armor Ball® and Hexprotect® covers, without any of the inconvenience. With two sizes available, the Rhombo cover system was designed to improve insulation where heat loss prevention is critical. It offers highly effective solutions to problematic liquid storage systems such as municipal and industrial wastewater, treatment processing plants, metal and petrochemical plants, leachate ponds, airports, raw water reservoirs and other applications for heat retention, photosynthesis prevention and or a wildlife deterrent. The Rhombo Hexoshield® system ensures coverage of up to 99%. The resulting thermal insulation barrier combines the insulation factor of the air held in each part with the poor heat conductivity of plastic. The substantial air pocket (4.5” for the Hexoshield 66 and 8.25” for the Hexoshield 189) dramatically reduces heat loss and VOCs. 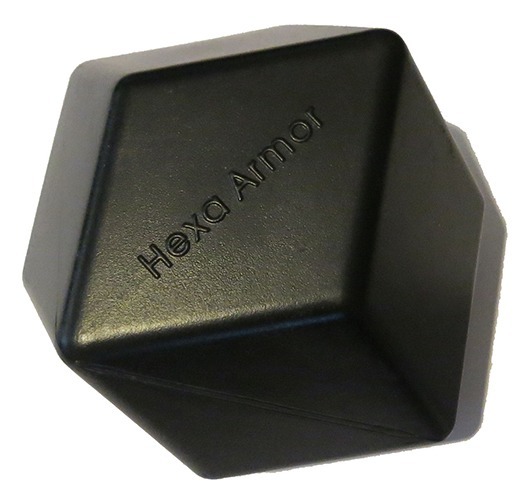 Symmetrical in all direction by design, the Hexoshield® does not leave any gap in between elements. This is our best cover for evaporation reductions (up to 99%). The flat faces of the Hexoshield® ensure a very tight packing even in strong winds. And contrary to other thin edges covers, it does stack or overlap. The Hexoshield® barrier, contrary to standard covers, does not represent an obstacle to static, moving or dipping equipment. The elements can be easily pushed aside and the cover reforms itself as the basin and obstacles change configuration, as in a clarifier. In fact, the elements will keep up with liquid level, rising, lowering and reforming the cover as needed. Hexoshield® are also an effective wildlife deterrent. When entirely covered, the body of water becomes unattractive to waterfowl and other wildlife such as deer. They simply don’t recognize it as water. Compared to netting, Hexoshield® are not sensitive to ice or snow damage and do not require any kind of support. Hexoshield® are produced with high quality high density polyethylene. The expected life time is 25 years. The Rhombo cover is made of virgin or recycled, high density polyethylene HDPE. Rhombo balls are widely used for all external applications due to their particular resistance to freezing and high wind conditions. The degrading effects of sunlight are prevented with UV stabilizing additives. 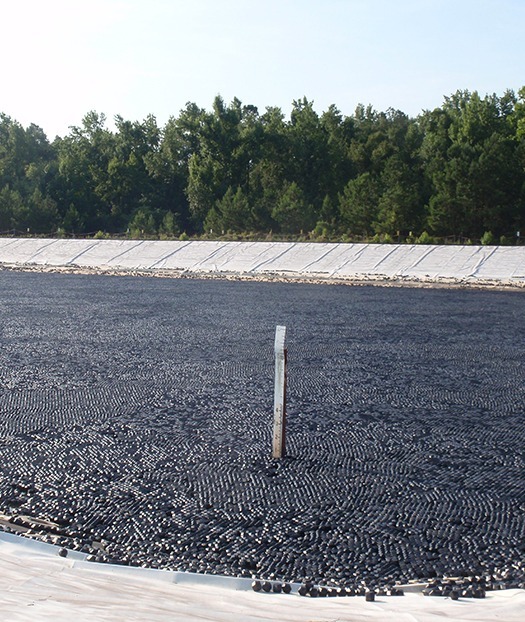 HDPE is recommended for most applications including demineralized water and Chromic acid applications. FDA (3) and NSF approved HDPE resins available for special applications. Using the Rhombo Hexoshield®, Savannah River Remediation, LLC is saving millions of gallons of well water and thousands of dollars every year. They were the receipient of the U.S. Department of Energy (DOE) 2017 Sustainability Award for waste reduction and pollution prevention.